Why are Ukraine separatist elections controversial? The two self-proclaimed "people's republics" run by pro-Russian separatists in eastern Ukraine are to hold presidential and parliamentary elections on 2 November. Ukraine, the US and the European Union say they will not recognise the results in the rebel-held Donetsk and Luhansk regions. They say the early elections violate an agreement with Russia and the separatists to hold local elections under Ukrainian law in those areas in December. 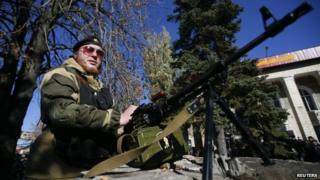 Russia, on the other hand, says it will recognise the polls as a way of granting the separatists electoral legitimacy. Why are the separatists holding these elections? The rebel Donetsk and Luhansk governments say the elections are a logical next step following local referendums in May that gave overwhelming support to their independence from Ukraine. Those referendums - not recognised internationally - took place after the rebels had seized official buildings in April. The rebels say that, as independent states, they are under no obligation to observe Ukrainian law. They did not take part in Ukrainian presidential and parliamentary elections this year. Ukraine and the West however argue that the Minsk ceasefire deal agreed in September provides only for elections in December, not for unilateral measures. Russian President Vladimir Putin says that all they agreed to in Minsk was to hold elections "in co-ordination with, not in line with" Ukrainian election plans. Who is standing for 'president'? Image caption Donetsk rebel leader Alexander Zakharchenko is the main "presidential candidate"
The two unrecognised mini-states adopted electoral laws in September that provide for directly-elected presidents and parliaments, both for terms of four years. Presidential candidates must have lived in the given "republic" for 10 years, and prospective MPs for five. In Donetsk, the main "presidential candidate" is Alexander Zakharchenko, the acting head of government. A recent opinion poll by the Donetsk University of Management gives him a commanding lead of 51%, with the other two candidates trailing in single figures, although nearly 43% say they have not made up their minds yet. The other candidates - a former riot squad officer and the deputy speaker of a separatist provisional assembly - also support the separatist line. In the absence of any opinion polls in Luhansk, the Russian media reckon that the leading presidential candidate is Igor Plotnitsky, the acting head of government. He faces three other candidates, including trade union leader Oleg Akimov and his own health minister, the high-profile Larisa Ayrapetyan. Who is standing for the local assemblies? The Donetsk opinion poll puts the "Donetsk Republic" group ahead on 39%, with "Free Donbass" close behind on 31.6%. Nearly a third of those polled have not yet decided but, as no other parties are standing, the parliament will be made up exclusively of separatists associated closely with the government of the "people's republic". In Luhansk, the three groups standing for parliament are Mr Plotnitsky's Peace to Luhansk, Mr Akimov's Luhansk Economic Union, and the lower-profile National Union. All are firmly separatist in sentiment. Will the elections be free and fair? There are serious doubts about the transparency of the electoral process and even the number of people registered to vote. The head of the Donetsk election commission, Igor Lyagin, says there will not only be polling stations in the 37 constituencies of the "people's republic", but another three in refugee camps in Russia. Voters can also cast their ballots by post or online, and the commission reserves the right to change the location and closing time of polling stations in the event of Ukrainian military attacks. All of these special provisions raise questions about transparency. In Luhansk, election commission chief Sergei Kozyakov acknowledges that he has no clear idea how many people are eligible to vote, given the numbers who have fled fighting in the region since the May referendum. Will international observers monitor the votes? The Donetsk republic says observers from fellow-separatist administrations in Abkhazia, South Ossetia and Nagorno-Karabakh will monitor the vote, along with some unspecified observers from Russia, Poland, Germany and Ghana. The West and international organisations are shunning the polls, and even Russian parliamentary officials say they have no plans to send observers. President Putin's spokesman Dmitry Peskov says the elections are a "local matter", but some individual Russian MPs may monitor the votes. What are the likely consequences of the elections? Ukraine seems unlikely to violate the fragile ceasefire by disrupting the elections, so clear but legally-disputed wins for the ruling separatists are certain. As such, this will not change the situation on the ground at all. The elections will have international resonance by further convincing Ukraine, the US and EU that Russia and the separatists are not serious about resolving the Donbass crisis amicably. US Secretary of State John Kerry has already denounced them as a "clear violation" of the Minsk agreements, and the EU ambassador to Moscow, Vygaudas Usackas, has warned Russia it may face further economic sanctions. Is this like Crimea all over again? Crimea, annexed by Russia in a military takeover in March, broke away from Ukraine after a controversial referendum and local election. The majority ethnic Russians in Crimea backed the move, but it was condemned internationally. The minority Crimean Tatars and Ukrainians there also opposed the annexation. Events in Donbass have been much bloodier, but there are clear parallels. Again heavily armed pro-Russian separatists are in power, organising the vote in defiance of Kiev and of international democratic standards. In 2008 a similar pattern unfolded in pro-Russian regions of Georgia - South Ossetia and Abkhazia. Only Russia recognises those regions as independent. Formal Russian recognition of Donetsk and Luhansk as independent states looks quite possible - but Russia might be reluctant to annex them, because of the enormous reconstruction cost after months of ruinous fighting.